There are 'old' Windows Phone 8.1 apps and then there are UWP apps for Windows 10, working on all screen sizes and displays. And then there are UWP applications where the developer has crossed every 't' and dotted every 'i', which just work faultlessly and comprehensively, optimised for whatever you run them on. Project Studio UWP is, quite simply, amazing, though its purpose in life is probably beyond the mundane activities of you or I! 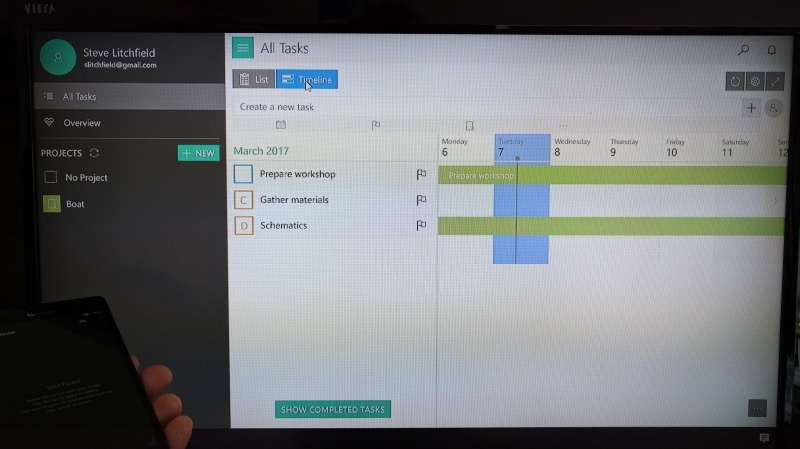 The closest most of us get to managing a project is planning some DIY - which is what I used here (in my imagination) for the screenshots in Project Studio, though in fairness for personal use a simple OneNote to-do list would work much better, since this tool is way over the top. But if, for work or club reasona, you find yourself in charge of a genuine multi-stage, multi-task, multi-person project, then this might just fit the bill within an all-Windows environment. 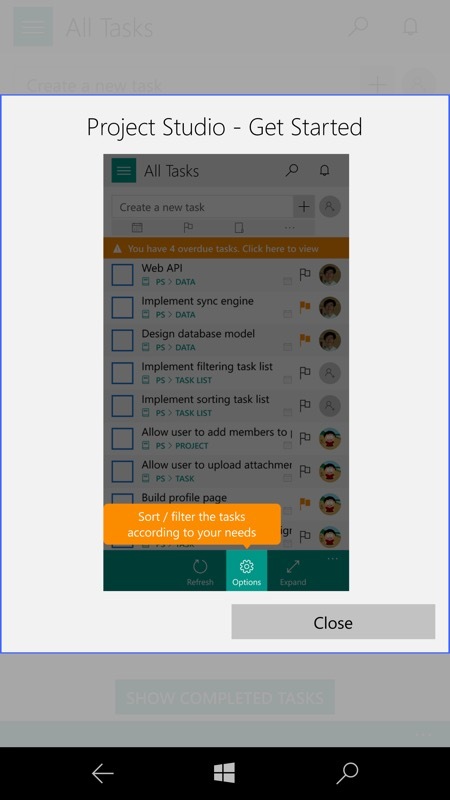 For example, you could start the project off on your Windows 10 Mobile smartphone, plug into a Continuum display to continue adding to it with the aid of a proper keyboard and mouse, then transition to a Windows 10 tablet to show off progress and planning to others. 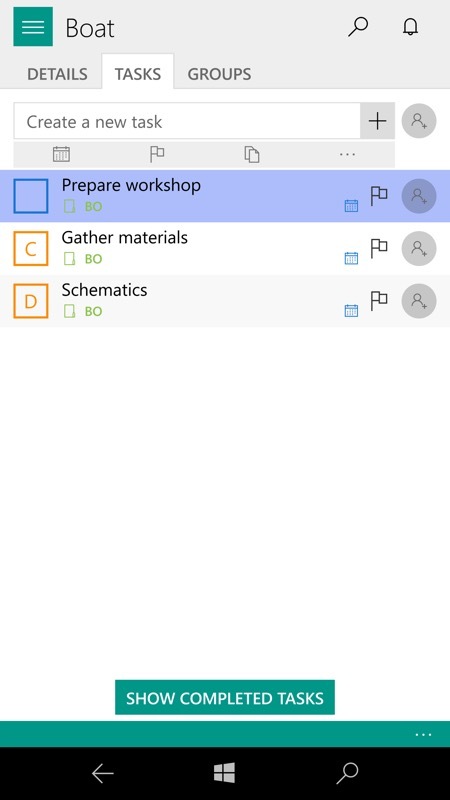 And finally collaborate with others on the project, with them joining in adding to the planning in Project Studio on their Windows 10 laptops. It's a compelling scenario. As with all good modern applications, there's an introductory set of tutorial slides on the first time launch - these are done well here, as shown above. You can reset these, to be shown again, in Settings, should you feel the need (see the button, below right). One of the core tenets here is that you shouldn't have to think about saving your project - everything's synced to your (free) vSoft account on the developer's server, by default every minute, so effectively in real time. And, when the time comes to invite others to collaborate on the project, they'll have this same near-real-time access to changes you make - and vice versa. 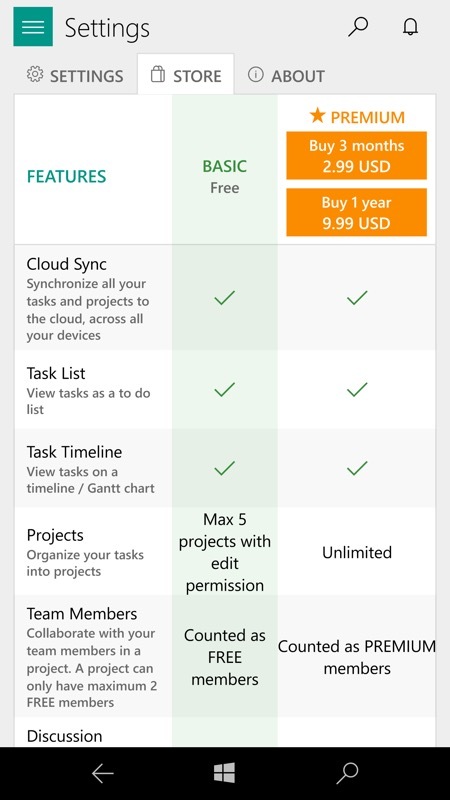 Project Studio is cleverly tiered, as shown below left, with all the basics being free and then, when your project starts to get serious or commercial, you'll find yourself needing to pay at some point to go 'premium'. Though even then the cost is trivial, at only $10 for a year. I don't say this very often, but I think this application should actually cost more, befitting its business/club/serious scope ($10 is nothing at all for a serious project)! Once into setting up a project and its various tasks and stages, everything's colourful and clear, as shown below, albeit all on a white background. This works well for project management, though the AMOLED purist in me would still like at least the option of a dark theme - on the phone, anyway. As you can see, each project gets built up, task by task, stage by stage, due data by due date. All very clear, but I missed some kind of graphical overview on the phone itself. 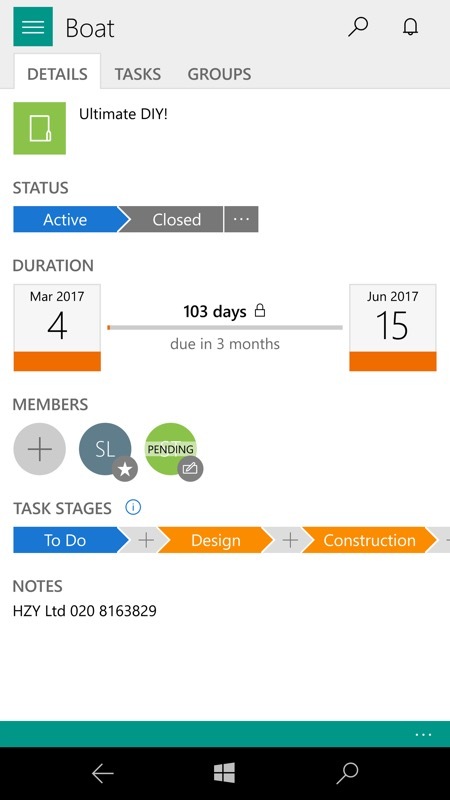 Project management usually involves Gantt charts at some point, but these are nowhere to be found on the phone-sized UI - yet, even on the Lumia 950 XL. 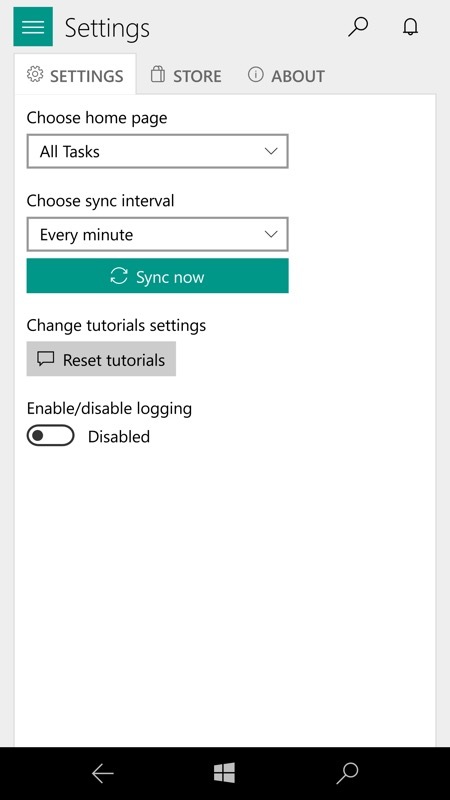 Plugging into a Continuum display or working on a larger device like a laptop reveals an extra overview option, 'Time line', as shown at the bottom of this review. Hopefully this can come to phone-sized UI layouts too. 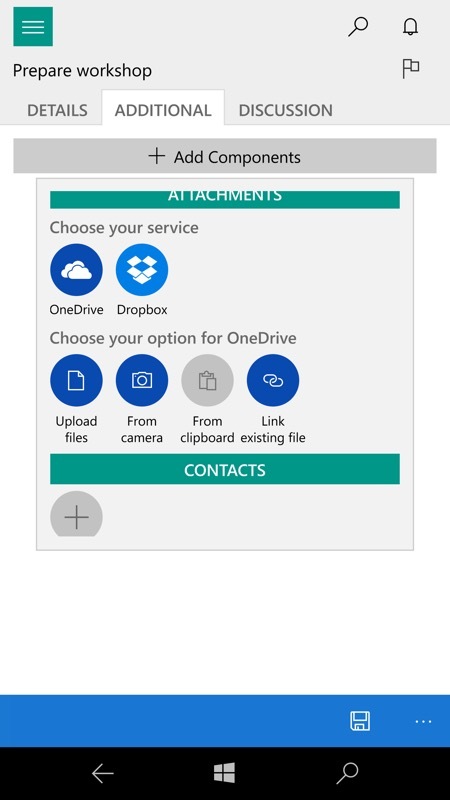 As with all good project management systems, tasks can have ancillaries/components, file attachments from local disks or from the Cloud, as shown below. For example, you might have a sketch or schematic that needs linking to. 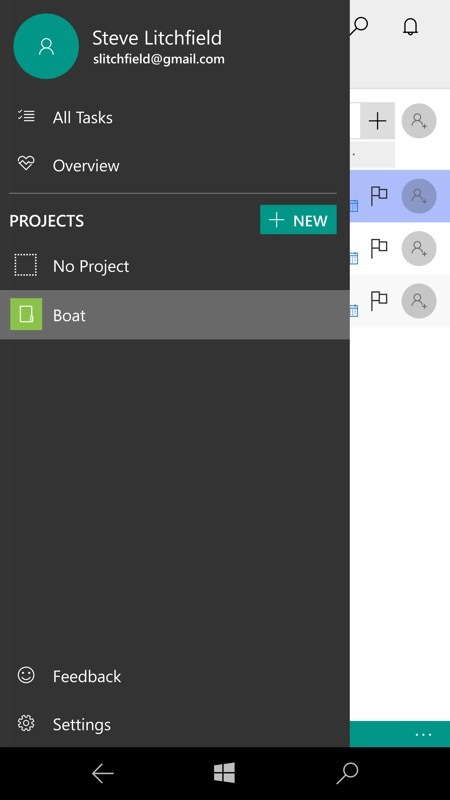 The hamburger menu in this UWP application lets you navigate easily between projects (as a busy professional, you may well have several on the go at any one time?!) 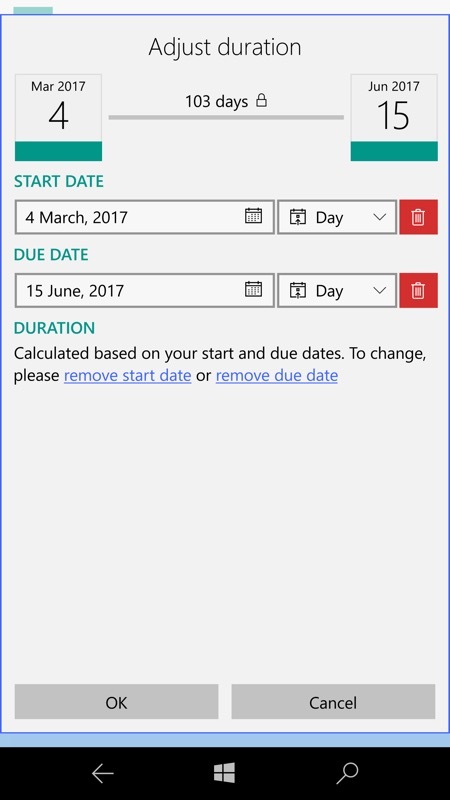 - the 'Overview' shown is sadly just a circle with a number in the middle, indicating the number of tasks remaining. 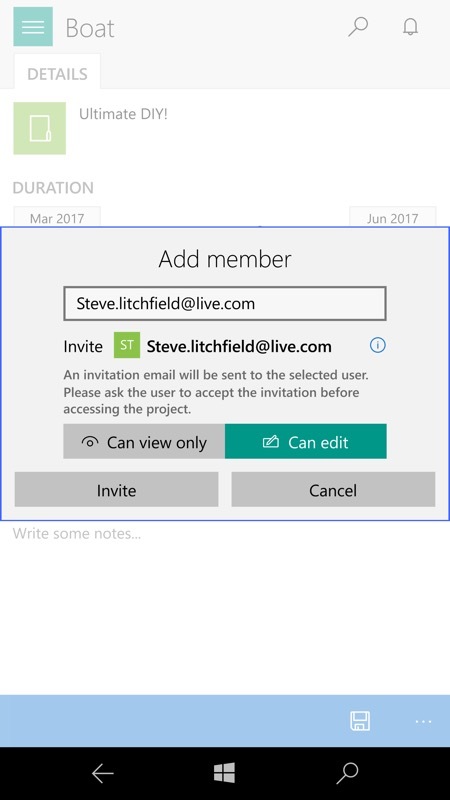 When inviting other Microsoft accounts to join in the project, you can opt to give 'view' or 'edit' access as needed, as shown below, left. 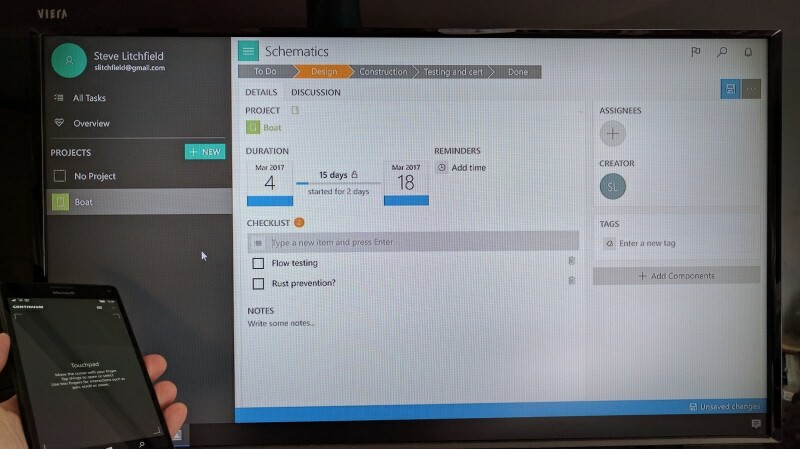 From there on, it's just a matter of working on the project planning wherever you (or they) are, from phones, tablets or desktops, all within Project Studio, and with the data living on the developer's servers. I couldn't see an export function, so this might be a worry for a long term project, i.e. should the developer vanish. I'm no project management expert, so couldn't advise on quite what Project Studio should export to, but it's something to bear in mind. Terrific stuff, and more power to the developers here. I received several updates in the last couple of weeks alone, so this is clearly still under active development. 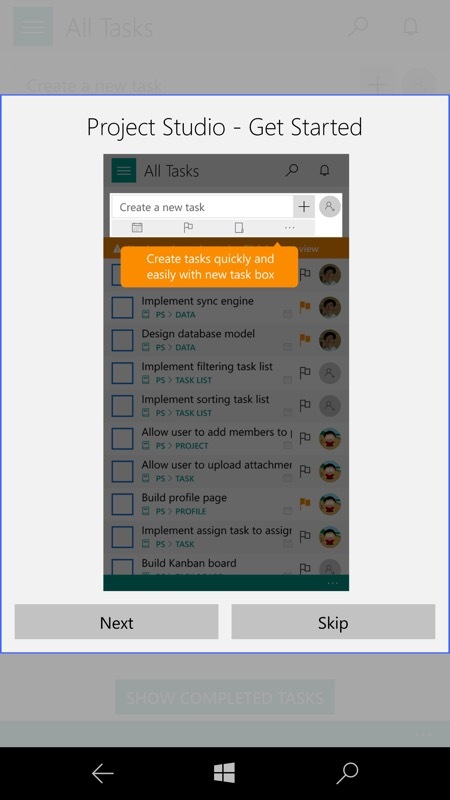 My suggestions: get that timeline/Gantt chart support built into the app when viewed on phones, add a dark theme for AMOLED phone use - and raise the cost of the premium tier!